Investors bruised by Wall Street's latest rout found little reason to pile back into the market. Stocks extended their losses in an erratic session Tuesday as investors wrestled with the reality that the economy is still far from a recovery. The pessimism that has dominated the markets for months stifled some tentative bargain hunting and in the process unraveled several attempts at a rally. The selling pushed the Standard & Poor's 500 index to its first close below 700 since Oct. 28, 1996. But the losses were modest compared with Monday, when the Dow Jones industrial average tumbled 300 points and both the Dow and the S&P 500 index registered their lowest finishes in more than a decade. Tuesday's fluctuations came as Federal Reserve Chairman Ben Bernanke told Congress an economic recovery depends on the government's ability to stabilize weak financial markets. He said the efforts were needed to avoid "a prolonged episode of economic stagnation." Investors are still worried the government won't succeed. On Monday, the government injected $30 billion to troubled insurer American International Group Inc., its fourth attempt to stabilize the company since September. Bernanke's remarks came as the central bank announced it would begin lending up to $200 billion in an initial move to spur consumer and small business borrowing for autos, education, credit cards and other expenses. The Fed first announced the plan late last year. That offered some support to the market and helped curb selling, traders said. "I think people are just finally happy to see that it's here and that it's going to begin," said Joe Saluzzi, co-head of equity trading at Themis Trading LLC. "Normally Wall Street will buy the rumor and sell on the news but I think this is kind of the opposite effect." According to preliminary calculations, the Dow fell 37.27, or 0.6 percent, to 6,726.02. The index is now down more than 52 percent from its record of 14,164.53 set in October 2007. Broader stock indicators also fell. The S&P 500 index slid 4.49, or 0.6 percent, to 696.33. The Nasdaq composite index fell 1.84, or 0.1 percent, to 1,321.01. 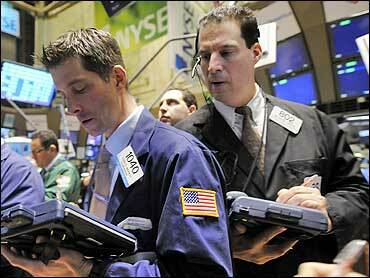 The Russell 2000 index of smaller companies fell 6.79, or 1.9 percent, to 361.01. Two stocks fell for every one that rose on the New York Stock Exchange, where volume came to a moderate 1.9 billion shares. Saluzzi said a rise prices of commodities like oil led to some speculation that global demand for raw materials could soon increase. Light, sweet crude rose $1.50 to settle at $41.65 a barrel on the New York Mercantile Exchange. May copper futures rose 8.85 cents to $1.6045 a pound, the highest close since Feb. 9. Investors showed little reaction to testimony from Treasury Secretary Timothy Geithner, who told the House Ways and Means Committee the added spending in the Obama administration's budget is necessary because the previous administration was unwilling to make long-term investments in health care, energy and education. President Barack Obama on Tuesday likened the stock market to the daily tracking polls used during campaigns. He said tracking Wall Street's "fits and starts" too closely could lead to bad long-term policy. Many investors remain fearful of buying into a market that has dashed investors' hopes that it had hit bottom. Last week, the Dow and the S&P 500 index fell through their November lows and, with their continuing pullback, are touching off fears that a new torrent of selling would take place. Brian Reynolds, chief market strategist at New York-based WJB Capital Group, said the stock market's slide means it could be ripe for a bounce but that a lasting recovery won't come until credit market investors begin to put money into riskier debt that is now out of favor. Investors have been buying the safest types of debt, like government bonds, in favor of mortgage and credit card debt and some corporate debt. "It's just another continuation of what we've seen for the last year and a half. If you compare the valuation in stocks to the valuation in credit, there is a huge disparity there," Reynolds said. He contends the S&P 500 index, which is down 22.9 percent in 2009, will continue to fall until it hits the 600 level. That would be a loss of another 13.8 percent. Investors are also beginning to look toward the Labor Department's February employment report, which is set for Friday. The monthly employment figures are one of the most important economic barometers because rising unemployment cuts into how much consumers spend. Consumer spending accounts for more than two-thirds of U.S. economic activity. Government bonds were mixed Tuesday. The yield on the benchmark 10-year Treasury note, which moves opposite its price, rose to 2.89 percent from 2.87 percent late Monday. The yield on the three-month T-bill, considered one of the safest investments, slipped to 0.26 percent from 0.27 percent from Monday. The dollar was mostly lower against other major currencies, while gold prices fell. Overseas, Britain's FTSE 100 fell 3.14 percent, Germany's DAX index rose 0.52 percent, and France's CAC-40 fell 1.04 percent. Japan's Nikkei stock average slipped 0.69 percent.